If your dog competes in agility, obedience, flyball, schutzhund, tracking, water work, conformation, or is your favorite running buddy, your dog needs special attention. Your dog needs to be treated like an athlete. Every athlete requires conditioning and cross training beyond their basic level of training. Athletic dogs need cross training and additional activities to bring them to their optimal level. For example, an effective conformation dog needs exercise and conditioning to perform at their best. The conformation dog needs to be an excellent example of the breed and needs to look good, move well and be able to perform the task they were bred to do. 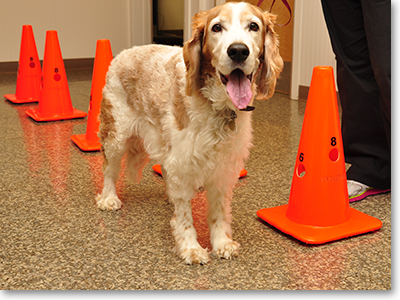 We will develop a conditioning program for your athletic dog utilizing the appropriate therapeutic methods. For example, the underwater treadmill is an effective means of exercise for conditioning and strength training of canine athletes. It is a low-impact method of working all the major muscle groups of the legs and moves the joints through a full range-of-motion, increasing strength and flexibility.